This luxurious leather sofa creates a comfortable and refined centerpiece for your living area. With rolled arms, turned feet, and soft cushions this sofa provides a great spot for taking it easy or impressing guests when entertaining. 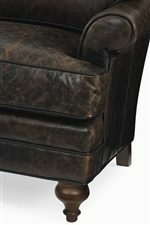 The Kasey Leather Sofa with Rolled Arms and Turned Wood Feet by C.R. Laine at Alison Craig Home Furnishings in the Naples, Fort Myers, Pelican Bay, Pine Ridge, Bonita Spring, Golden Gate, Estero, Cape Coral, Marco Island, Sanibel/Captiva Island, Point Charlotte, Ave Maria, Florida area. Product availability may vary. Contact us for the most current availability on this product. Frame Construction Frames are made using 5/4” or thicker, kiln-dried select hardwoods and are doweled, glued and block reinforced for rigidity and strength. Each piece is designed and gauged to withstand everyday use. Seat Support Comfortable seating begins with non-absorbent, odor-free polypropylene sheeting and steel bands, which provide superior support for the double-cone coil springs. These springs are clinched to prevent shifting, and then hand-tied in eight directions. Padding & Ergonomics Standard Fill Back cushions are constructed with conjugated polyester fibers and encased in a channeled ticking. Muslin wrapped cushions. Warranty The frame excluding legs is warranted against defective material and workmanship for the life of the original owner. The spring system is warranted against defective material and workmanship for life to the original owner. Cushions warranted for 5 years. Taking inspiration from both classic cottage charm and modern loft living, the Kasey collection offers comfortable, sophisticated seating whether you are relaxing with family or entertaining friends. The rolled arms, traditional turned feet, and modern proportions with plush t-style cushions make any item in the Kasey collection a fantastic addition to your home. All items in the Kasey collection are available in your choice of a wide range of custom leather or fabric upholstery options. The Kasey collection is a great option if you are looking for Contemporary furniture in the Naples, Fort Myers, Pelican Bay, Pine Ridge, Bonita Spring, Golden Gate, Estero, Cape Coral, Marco Island, Sanibel/Captiva Island, Point Charlotte, Ave Maria, Florida area. Browse other items in the Kasey collection from Alison Craig Home Furnishings in the Naples, Fort Myers, Pelican Bay, Pine Ridge, Bonita Spring, Golden Gate, Estero, Cape Coral, Marco Island, Sanibel/Captiva Island, Point Charlotte, Ave Maria, Florida area.